The golf swing is impossible to master! You can only hope to gain enough of a grasp on the different components to not embarrass yourself on the course! Not even the PGA Tour professionals have it figured out! They are always adjusting parts of their swing to find an edge. 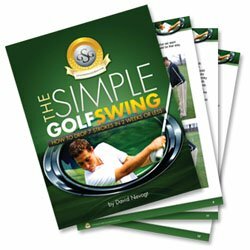 Here you will find a comprehensive review of all the the main parts of the golf swing. Whether you are a beginner and just starting out, or a veteran who needs a refresher, this should be your one stop for golf swing tips and information! All aspects of the swing will be examined from the grip, to the setup, and all the way from backswing to the follow through. Also, there are pages on two of the most common, and frustrating, end results of your golf swing: a hook or a slice. So read up, and hopefully these golf swing tips will help improve your game! Also, do you have a great swing tip or golf swing advice? Please pay it forward and share with others here! The first component will be a proper golf grip. There are three main golf grip styles (overlapping, interlocking, and baseball). All three are built upon similar hand positions but include slight modifications. Utilizing a proper golf grip is just one step to avoiding a dreaded slice or hook. This page includes step by step instructions for a proper golf grip, plus pictures in case you need a visual reference. After the grip, the next aspect is a correct golf stance. The golf stance not limited to just alignment. It also include foot position, posture, ball position, and hand position. In addition to a poor grip, a bad stance can also lead to errant shots. Even though it doesn't have to do with alignment, maintaining good posture is an extremely important aspect of the golf stance. Good posture will allow your spine and muscles to work more effectively to produce better shots! Now that you know the proper grip and stance, you are ready to begin the swing. The first phase will be the backswing. The golf backswing is extremely important because any error here will translate to the club face being out of position at impact. There are some common misconceptions about the backswing that are addressed here. Also, you will find some basic tips for a more effective swing. Beginning from the top of the backswing, a smooth transition into the downswing is essential for good contact at impact. The downswing is a release of all of the energy that was coiled during the backswing. Check out the downswing page to learn how to make a proper transition! A balanced follow through is the ideal way to end the golf swing. Your hips began to rotate towards the target during the downswing, and this will need to continue throughout this next phase. At the end of the swing, your balance should mostly be on the lead foot, hips pointing towards the target, and back slightly extended. Many people finish off balanced due to a variety of factors. Even though contact with the ball has been made, a good follow through is still important. Probably the most common golf swing mistake is the slice. A golf slice is the combination of two factors: an open club face, and an outside to in club head path. These combined put spin on the ball after impact which cause the ball to bend to the right. There are a couple key things that you can do to try to eliminate a slice. Learn about them here! While not as common as a golf slice, a hook can be just a bad! Essentially the opposite of the slice, a hook is caused by a closed grip and an inward-out swing path. This will cause the ball to bend sharply to the left during flight. Similar to the slice, learning a few key tips to cure a hook will help lower scores. Are you the type of golfer that lets frustration take over after a poor shot? Are you looking to improve your golf game by learning to relax, breathe, and clear your mind more effectively? Struggling with the golf mental game can have significant implications on the scorecard. This page provides an introduction into the basic of mental training for golf, and provides you with an excellent resource to further your training. *Also, if you are looking for more golf swing tips, particularly for beginners, John Murray, PGA Professional, has created Golf Gamut, a site focusing on tips casual and beginner golfers. John takes a simple approach to help you learn the game. Have Any Tips That Have Improved Your Golf Game? Myself and the other visitors of this site would love to hear it! So pay it forward and share your tips here! Your tip will appear on a Web page exactly the way you enter it here. You can wrap a word in square brackets to make it appear bold. For example [my tip] would show as my tip on the Web page containing your story. And please don't be skimpy! Provide comprehensive advice and detailed tips!